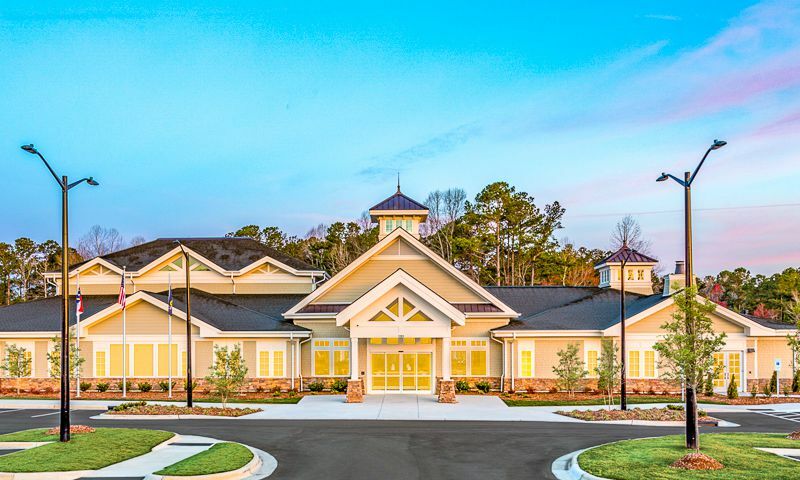 Del Webb at Traditions is a brand new active adult community located in Wake Forest, North Carolina. The community will consist of 452 single-family residences. An 18,000 square foot clubhouse is the perfect place for neighbors to come together and socialize. Residents live comfortably knowing that this low-maintenance community takes care of basic chores so they have more time to pursue social activities and events with friends and family. Homeowners have plenty of options for shopping and dining in downtown Wake Forest. Residents will also have easy access to major highways to Raleigh and Durham for additional entertainment, museums, medical facilities, and attractions. Residents can enjoy an active and exciting lifestyle at Del Webb at Traditions. The well-appointed 18,000 square-foot clubhouse at the heart of the community will be the epicenter for all the clubs and activities one can imagine. A fitness center will be provided for those looking to stay in shape in addition to an indoor pool for residents to swim in year round. There will be a coffee bar for catching up with neighbors. Residents can also enjoy a game of billiards at the clubhouse table. There will be an arts and crafts studio for creative clubs and a catering kitchen that will be perfect for making snacks before parties. Outdoors, challenge your friends to a rousing game of pickleball or tennis on the provided courts next to the clubhouse or spend all afternoon playing an exciting game of bocce ball. There will be a community garden for those with a green thumb, or you can just get out and enjoy the wonderful fresh air with the community's trails and paths that will wind through the parks and natural spaces all over Del Webb at Traditions. Del Webb at Traditions broke ground in 2017 and plans to include 452 single-family homes when finished. Built by Del Webb, these homes will be offered in nine different spacious ranch floor plans. Homes in this community will range in size from 1,656 up to 2,536 square-feet of living space. These homes will include two to four bedrooms, two to four-and-a-half bathrooms, and an attached two-car garage. All homes include master-on-main suites, flex rooms, and well-equipped kitchens. Some homes come with additional options like loft spaces, patios, and tray ceilings for the dining rooms and master suites. Residents of Del Webb at Traditions will live an active and exciting lifestyle. There will be classes for yoga, aerobics, and water aerobics. Residents will also have clubs like the travel club, book club, and the Flying Solo singles club. An on-site activities director is available so homeowners will have all the support they need to start up new activities and clubs based on their interests. A homeowners association fee will ensure that all the basic maintenance of your home and common areas is tended to so you'll spend more time relaxing and no time worrying about lawn care. Del Webb at Traditions is ideally located in Wake Forest, North Carolina. Directly north of downtown Raleigh on state roads 1 and 401, residents will have easy access to all the entertainment, recreation, and culture the city has to offer. The NC Museum of Science and the NC Museum of History are nearby, as well as the stadium for the Carolina Hurricanes NHL team. When traveling farther is needed, Raleigh-Durham International Airport is only a 40-minute drive away. With innovative, low-maintenance homes and charming amenities, Del Webb at Traditions is the perfect place to find a home in the Raleigh-Durham Area. Regency Manor Clubhouse - 18,000 Sq. Ft. There are plenty of activities available in Del Webb at Traditions. Here is a sample of some of the clubs, activities and classes offered here. Built by Del Webb, these homes will be offered in nine different spacious floor plans. Homes in this community will range in size from 1,656 up to 2,536 square-feet of living space. These homes will include two to four bedrooms, two to four-and-a-half bathrooms, and an attached two-car garage. All homes include master-on-main suites, flex rooms, and well-equipped kitchens. Some homes come with additional options like loft spaces, patios, and tray ceilings for the dining rooms and master suites. Please Note: Not all floor plans available at this time. 55places.com is not affiliated with the developer(s) or homeowners association of Del Webb at Traditions. The information you submit is distributed to a 55places.com Partner Agent, who is a licensed real estate agent. The information regarding Del Webb at Traditions has not been verified or approved by the developer or homeowners association. Please verify all information prior to purchasing. 55places.com is not responsible for any errors regarding the information displayed on this website.